Myanmar contractor Shwe Taung Development has taken delivery of three Liebherr 280 EC-H 12 tower cranes. The first of the three cranes was supplied to help with the construction of the Twin Centro development in Yangon, Myanmar. The location of the project site meant that the crane needed a shortened jib, which was designed especially for the project, a company spokesperson said. The Twin Centro development, on Baho Road in Sanchaung Township, is made up of a 16 storey apartment building, complete with a pool, recreation centre and garden. Shwe Taung is the owner and developer of the project. 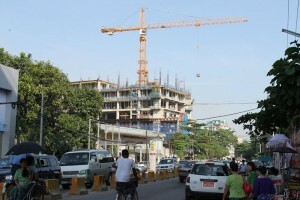 Mike Tay, sales manager at Liebherr Singapore’s tower crane division, said, “The development is on a particularly busy road, opposite one of Yangon’s leading hospitals, and the twin tower blocks are located very close to the road. Shwe Taung asked us to modify the jib to prevent it over-sailing the road. As a result of the changes, the maximum load of 12 tonnes will be handled in 2-fall reeving and can be taken out to 26 m, Tay explained. The crane has been positioned between the two towers, allowing it to service all the lifting requirements for both towers. The project is due for completion in late 2015.